Apparently there has been a threat made against some shopping malls in America. Specifically the Mall of America in Bloomington, MN. Homeland Security Secretary Jeh Johnson has warned shoppers of this threat. It seems that the Somalia-based terror group al-Shabab released a video calling for the crazies to practice some random criminal violence in the mall. Although several websites refer to al-Shabab as an Islamist group who is fighting for the creation of a fundamentalist Islamic state in Somalia we shouldn’t jump to conclusions and assume they’re Islamic. I’m sure they can’t be that because according to our President Obama, 99.9% of Muslims simply seek peace and order and love just as we do and most have western values. This left me with an uneasy feeling until I went over to the Mall of America’s website and was re-assured. Phew!!! I’m happy to report there’s nothing to worry about folks. Go about your shopping today like any other day, it seems like they have this thing covered. Ha! We are clever infidels! You see the Mall of America doesn’t allow firearms inside. Check out the security information from their website right here. The commission of any act defined by Federal, State or local ordinances as a criminal act is prohibited. These include, but are not limited to: graffiti, property damage, defacing, damaging or destroying any real or personal property, etc. Guns are banned on these premises. Using or possessing consumer fireworks is prohibited. Appropriate attire, including shirts and shoes, must be worn. Wearing apparel which has obscene language, obscene gestures, or racial / religious / ethnic slurs that are likely to create a disturbance is prohibited. Wearing clothing which deliberately obscures the face: such as hooded tops, will not be allowed. Bulletproof vests or simulated bulletproof vests will not be allowed. Please note that Mall of America conducts monthly lockdown drills. The drill will take place five minutes after Mall opening and five minutes before Mall close every month. I guess that confirms it. There will be no terror attacks in the Mall of America. No terrorist is going to risk arrest and a fine by stupidly carrying a gun into the Mall of America when they know it’s a gun-free-zone. And with the regular monthly “Lockdown Drills” all of we infidels should be quite adept at hiding should anything happen so there will be no one to shoot at. And since the terrorists aren’t allowed to wear bullet-proof vests they would be sitting ducks for the mall cops…………………..who are apparently not armed, but, not to worry, the regular police who would arrive within 30 – 45 minutes. I sure am glad they have that covered. 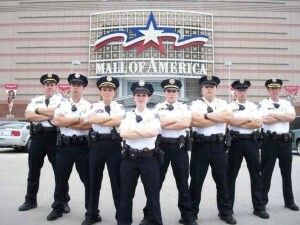 Mall of America security pictured below.